Houston in the blind, we need emotional gravity. 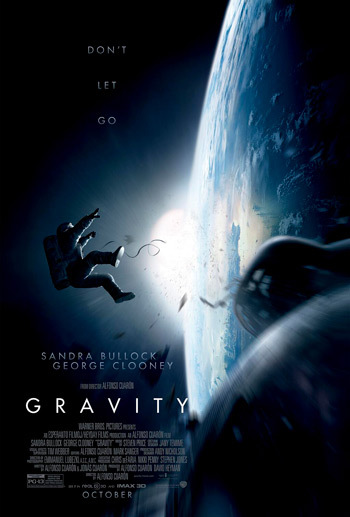 Dr. Ryan Stone (Sandra Bullock), Matt Kowalski (George Clooney) and Shariff (Paul Sharma) are space walking and servicing Hubble space telescope. When they are hit by high-speed debris from a destroyed Russian satellite that had started a chain reaction of satellites crashing into each other. Ryan and Matt survive and are trying to find a way to return. Soon they find themselves in a situation where Matt decides to drift off into space to save Ryan. Now she is the sole survivor and must find a way to return back to the Earth. The first thing that you notice about the film is great visuals. It’s shockingly real. The second great thing was sound, or lack of it. The way they played with sound and silence was remarkable. Satellites are never so close in space. At least not like the way they show in the film. Going from one satellite to another is not such a simple thing that one person can do it. The first thing is a cause which is at the basis of the film; it took some effort to ignore it and buy into the film. But once I was over the first blunder, I was irritated by the second one which kept reminding me of the first. Some wires are burning when Ryan enters the ISS. If my memory hasn’t failed me, the flames that were floating out of it were upward. That can’t happen without gravity; there is no up! A bolt that you can easily lose and never find it again. It might even come back and blast through you like a bullet. A wire that they kept jerking away and it kept coming back. And the best of all depictions: Ryan was rolling away in the space after the debris hits their station. And there was nothing to stop or nothing she could do about it. The helplessness and disorientation was very well portrayed. After crashing in the sea and reaching the sea-shore, Ryan had trouble standing and walking. That bit almost made my day. These things were brilliantly done. The sheer contrast between what was right and wrong kept me distracted. And I think the reason I was noticing all this was because there was not much in the story. The story, in essence, is nothing more than emotionally unstable Ryan trying to get back to earth. Though it wasn’t boring, and that’s remarkable! But it did give me time to think about everything else that was happening. To add to that, I couldn’t sympathise with the characters. Throughout the film I had a feeling that I don’t know them well enough and they were not real enough to get an emotional response. However, they handpicked the things they could be wrong about. Most people won’t know the technical flaws and might just enjoy the film. But it didn’t work for me. It didn’t have any emotional gravity and disappointed the astronomy fanboy in me. In the end I was left with nothing more than a nice visual experience. The quality of visuals in the film is extraordinary and makes it worth a watch. But don’t expect anything more. PS: Part of the reason it didn’t hit me because geniuses at PVR IMAX, Lower Parel decided to have an interval in a freaking 90 minute film! And their sound system really needs an upgrade. Published on October 13, 2013. Updated on October 14, 2013.